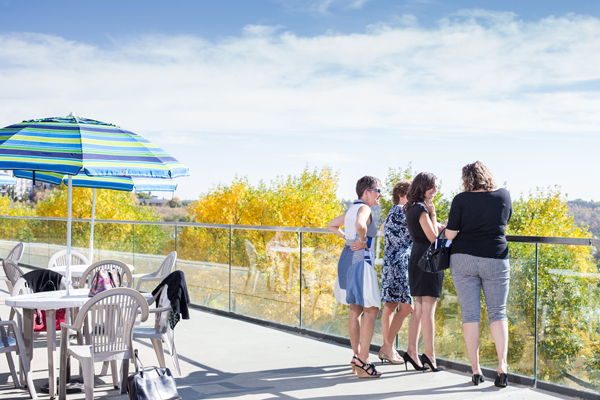 On September 22, Edmonton experienced a near-perfect day. The city’s trees were somewhere between green and yellow, and the winds had yet to blow the leaves from their branches. The sun’s arc over the south of the city shot temperatures into the high 20s, and experienced Edmontonians knew it might be the last summer-like day of 2014. The question generated dozens of answers—everything from “how we can create an ambassador program for the youth” to “how we can bring more beauty into the space.” For every topic discussed, participants were tasked with capturing the ideas they shared and posting them for all to see. 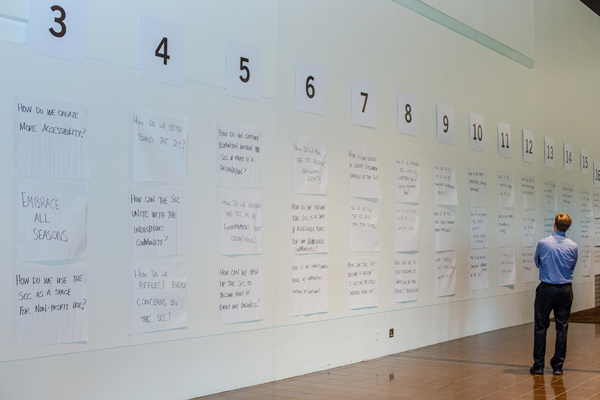 At the end of the day, participants faced a wall full of ideas and, armed with 10 small stickers, they marked the topics they believed were most worthwhile. One-third of the ideas would be obvious low-hanging fruit that the Shaw would be foolish not to act on. One-third of the ideas would require careful consideration and might need operational, budgetary, or organizational decisions. One-third of the ideas would be so outlandish that they wouldn’t be possible, but might trigger other ideas that could potentially change the course of the Shaw’s future. While we’ve committed to supplying a full report to the community by the end of October 2014, outlining all the ideas discussed during the Open Space, here we’ll share three ideas that attracted more stickers than any other. The river valley is a vital part of Edmonton, but accessibility for visitors and Edmontonians is lacking. Currently its use is limited because of mobility issues, lack of knowledge, and few interesting aspects. What were the key messages of the conversation? It could serve as a means for the Edmonton public to learn about the history of the city. Marketing is needed to create better wayfinding and communication to both locals and visitors. There needs to be a mixture of public and commercial development to bring more people through the Shaw and into the river valley. There needs to be a conversation between public and private interests to funnel more people into the river valley. First impressions mean a lot, and creating an activated, engaging space could do a lot for the way the Shaw is thought of and used. The public perception is that the Edmonton Convention Centre is closed unless you’re there for an event. The front of the Shaw should be more impressive, more akin to a Hollywood sign. We should create engaging environments within the public space of the Shaw to encourage citizens to come inside. Consider including a bistro like Kids in the Hall. Create a business centre or pod-type environment where people can work. Consider including interactive media displays that are functional and engaging to pedestrian traffic. Create more safe access to all public spaces, including the terraces and patio. We have a responsibility to integrate and embrace our growing Aboriginal population. What were the key messages of this conversation? Interests of indigenous communities need to come forward and be integrated into ongoing processes and discussions. Build a monument and time capsule with focus on community; perhaps include a timeline for the last centuries. Create an Aboriginal history museum with a focus on contemporary art. Rename salons to showcase indigenous history. 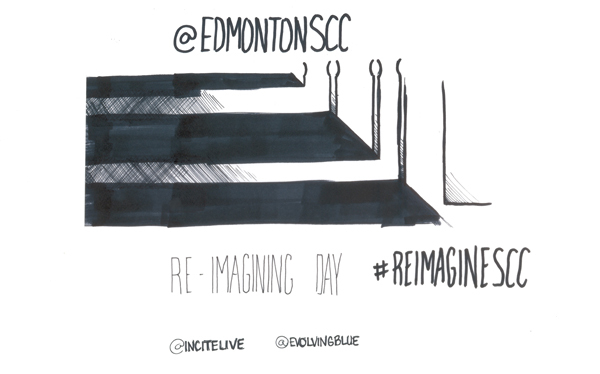 Initiate weekly meetings for the indigenous community in the Edmonton Convention Centre. Define and involve the indigenous community and then bring more people into the conversation. 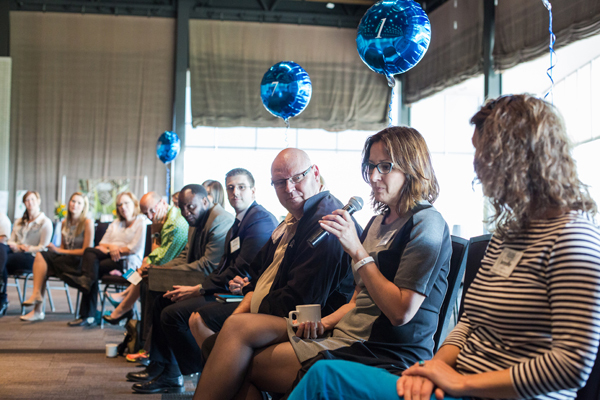 These three topics are just a taste of the ideas we saw at last week’s event. And it’s important to note that this flurry of conceptual thinking was not done with the intent of making hard and fast decisions as to what should happen at the Shaw. Instead, it was an opportunity for engaged citizens to offer their perspective and grow the river of possibilities available to our facilities. Over the course of the day, attendees experienced an inspired poem written and performed by Rayanne Doucet, executive director of the Edmonton Poetry Festival, to summarize the spirit of the event. 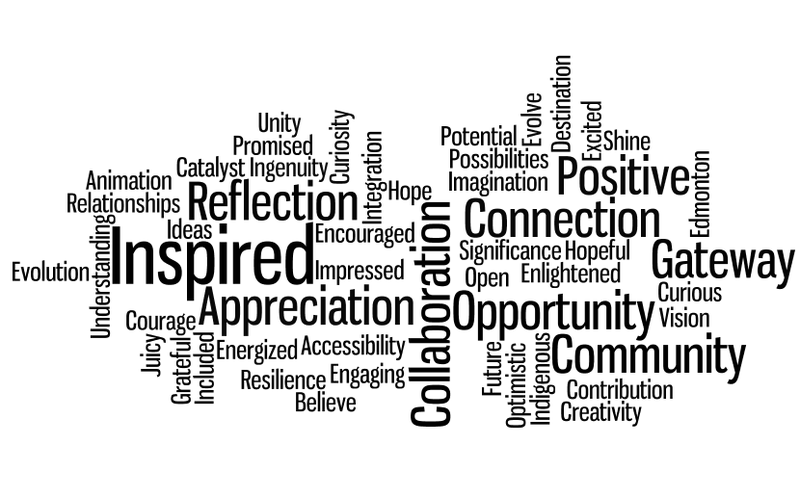 At the end of the session, each participant was asked to check out with just one word. We’ll leave you with their sentiments here. through the limbs of our city. my head like a drumbeat. or not thought of yet. of a future, of a history, of a celebration. Look to earth, wind, water and fire. Show us your sweet blue rivers. Connect us to your lovers. Dare us to stand up and respect you. Close your eyes, breathe deep and jump. This place is not brick, stone, mortar. the writer cradling her pen like a lifeline. the community leader engaging in a drum circle. It is the smell of sweet grass. to lead the way to new beginnings. We ask you to remember. You are more than a place.